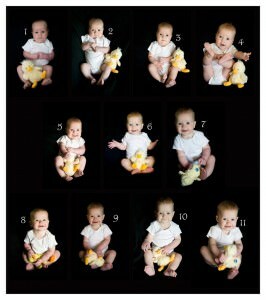 I LOVE this collage of Princess P. It’s amazing to see how that baby grows in the first year. Yes, it does look like my baby is floating in a black nebula. Thanks for asking. I just take black fleece that I bought at Joann’s (look for a sale, or use a coupon to get the best price, of course). I bought 2 yards, I’m pretty sure. I just drape it over an overstuffed chair. In the beginning I kind of shoved her in between two pillows so she’d prop up, but now I’m just hurrying to take a picture before she runs off. We used a duck we got as a baby present. Easy Schmeezy, and I love to see how much bigger she’s gotten!